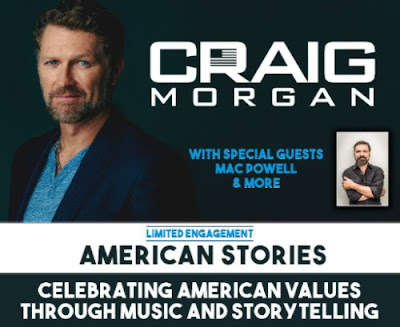 Craig Morgan is announcing a captivating lineup of special guests for his “American Stories” concert experience launching later this month. The Country music entertainer, military veteran and award-winning TV host kicks off this limited engagement tour in late October with six shows running through November featuring performances by Morgan, Third Day front man Mac Powell and several special guests. Joining opening weekend is hit songwriter Shane Minor (“Chillin’ It,” “Beautiful Mess”) and Nashville recording artist, former Army Ranger and decorated combat veteran of the Blackhawk Down battle of Mogadishu, Keni Thomas. Best-selling author (American Wife) and Veterans’ family activist Taya Kyle along with songwriter/producer Phil O’Donnell (“Give It All We Got Tonight,” “Back When I Knew It All”) will join Morgan for shows in Washington D.C. and Roanoke, VA. The final weekend will feature songwriter Marla Cannon-Goodman (“The Fool,” “Rock On”) and Medal of Honor recipient and author (Red Platoon: A True Story of American Valor) Clint Romesha. The “American Stories” limited engagement concert experience will include a collaboration from Morgan and Powell on the inspiring ballad “Hearts I Leave Behind” from A Whole Lot More To Me, which recently released on Black River Entertainment. The singers will later take the stage together along with the aforementioned songwriters and military heroes to celebrate American values through music and storytelling. Tickets are available at CraigMorgan.com. The Black River Entertainment recording artist’s ninth album, A Whole Lot More To Me, released June 3rd and includes “I’ll Be Home Soon” and “When I’m Gone.” Co-produced by Craig and Byron Gallimore (Tim McGraw, Faith Hill, Lee Ann Womack), Morgan co-wrote nearly half of the album's tracks with some of Music City's hottest writers like Josh Osborne, Kevin Denney, Jim McBride and Phil O'Donnell.